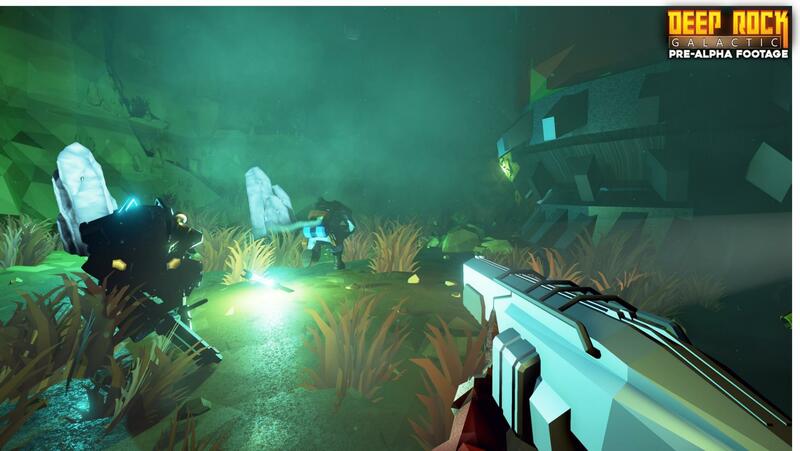 Co-Optimus: Your first title, Deep Rock Galactic, is about a group of dwarves that are sent to a hostile planet to try and extract all the precious minerals they can find. You’ve described the gameplay as “Left 4 Dead meets Minecraft.” Could you expand upon that a little more? Will players have to use the materials they find to build defenses? Søren: So, when we say “Left 4 Dead meets Minecraft”, we basically mean “co-op action in a procedurally generated world”. In Left 4 Dead, working together is crucial to your survival, the action is intense, and the special enemies force you to think and plan, it’s not just run’n’gun. Minecraft, on the other hand, gives the player a true sense of exploration and wonder - each level is unique, the world is fully destructible, and full of things to discover. Those are the qualities we aim to combine in Deep Rock Galactic. We’re focusing on the caves, because it fitted the vision of digging for gold, but also because it very handily limits our scope - the same goes for setting the game on a single planet, and not in an entire galaxy or universe. Our goal is to create the most awesome and beautiful procedurally generated caves ever. Or something close to that. When referencing Minecraft, we often get asked about crafting. Let us be clear: Deep Rock Galactic is not a Crafting-Survival game. You will be gathering minerals, yes, but there is no conventional inventory, and no crafting mechanic. The minerals you mine will be used for upgrades and unlocks, but the exact specifcs are still up in the air. In our current build, you are simply mining Gold for the satisfaction of it, but the plan is to add a lot of different minerals and things like Alien Relics and other strange stuff you’ll find in the caves. These resources are then handed in to your employer, the space mining company Deep Rock Galactic, and exchanged for upgrades for characters and gear between missions. How exactly this economy will work is undecided. There will be SOME building, however - we want you to be able to build defenses and such using resources you gather during the missions, using the tools you brought. As an example, the Engineer can build a Gun Turret, but he can only assemble a limited number of them using his initial payload. By spending the minerals, you find (currently Gold), you can call in a Resupply Pod and your payload is refilled as if you just started the mission. So, it’s not crafting, but there is a sense of resource management. It’s important to emphasize that this resource system is not developed very far though, and things might change a lot in the coming months. Co-Optimus: You’ve also talked about how there are four “meta-classes”: Digger, Gunner, Engineer, and Navigator. How do each of these classes work? Are all four classes required in a four player game? Søren: For the 4-player game, we recommend using one of each, but it is not something we strictly enforce if you want to change it up. Every Dwarf comes with a basic set of weapons and tools, including a handy pick-axe for digging anywhere. So, no matter your class, you are never stuck for long, and if you want to try a mission with 4 Drillers, then go right ahead! But, if you’re in a team where all 4 classes are represented, then no obstacle is insurmountable. Our classes are more akin to what you see in, say, Team Fortress 2 than Left 4 Dead when it comes to variety. We refer to them as meta-classes, because we aim for a meta-game where the player can customize the toolset of each, creating his own specialized versions of them - a bit like you’d see in Diablo or an MMO. Again, this is something very much in development and extremely subject to change! It’s also something which might not be super deep in the very early version of the game, but expanded as we update with new versions during Early Access. We’ll see. So how do the classes work? Some of them are pretty straight forward, like the Gunner. He is basically a huge gun on legs, and he is there primarily to protect the group. He has access to heavy weapons like the Gatling Gun, that shoots high caliber rounds that chew up the terrain around him and tears through monsters like paper. But if you want to dig holes, you should pick the Driller - he comes equipped with a twin set of enormous drills that chews through rock like butter, and can very quickly make tunnels for the entire team to use. The Drill can also be used in close combat, and since he also equipped with a close-range flame-thrower, he is the go-to melee specialist. Page created in 0.3153 seconds.